I love books. I love books more than chocolate---and that's saying something. I love books so much I often wonder where enjoyment ends and addiction begins. So I thought choosing a book for a review would be easy---not. My house is covered with cases, drawers, closets and bins filled with books. Books on the TBR (to be read) list that I can't ever find enough time to read. Books on the TBD (to be donated) list because I believe in helping other authors find new readers. And, of course, TKS (the keeper shelf). Although I have read may great, awesome, wonderful books, there are very , very few I keep on my keeper shelf. To earn their place on that shelf they have had to reach inside my soul, squeeze my heart and become seared forever in my memory. Where Mercy Flows is one of those books. It is a prodigal daughter story meshed with romance and suspense. Samanta Dodd believed that she was never able to live up to the rigid expectations of her father, a state superior court judge. Her father had always approached life with a black-and-white-no-shades-of-gray personal code of standards and Sam had never measured up. Ill and destitute, Sam is forced to return to her childhood home and brings her son, T.J. with her. Believing her father incapable of forgiveness and herself undeserving, the homecoming is difficult. Life becomes more complicated when you add to the mix a childhood friend, Donnie Duncan, who wants more from Sam than she is able to give. Her illness becomes more serious than first suspected. T.J.'s father reappears in her life. And the judge receives threats on his life. This book is like riding a train that comfortably chugs away from the station only to plunge the reader into a can't-put-down read. Karen Harter does an awesome job of looking inside a family and presenting a tale of hope, love and redemption. Be sure you set enough time aside to read this wonderful book from cover to cover. And grab a hankie before you sit down because this is definitely a tear-jerker which you won't forget for a long, long time to come. 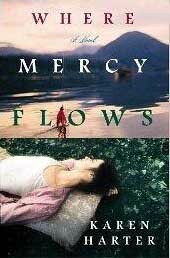 Where Mercy Flows is available at Amazon.com. You're a great salesman, Diane. This sounds wonderful! Beautiful book cover. This is the first I've heard of Karen Harter. Great job, Diane! I love hearing about books that other voracious readers deem worthy to remain on their already crowded shelves! Diane, thanks for reviewing this book. I LOVE romantic suspense. I'll look for this book. Great posts here. I'm now a follower too! I am on a critique loop with Anita. She is an incredible writer and I feel that my writing improves by being able to read and critique her work. Thanks for stopping in. We generally do themes each week but almost always a book review on saturdays. Thanks for sharing our blog on your links! Book sounds awesome. Nice to see you officially on the site, Diane. The book sounds fascinating. Thanks for sharing, Diane! Mirella, thanks for stopping in. We're so glad you joined us and that you would become a follower! Of course I had to check out your sites too. Bravo! They are lovely. I bookmarked them and I know I'll be back often!